Being an early adopter of new technology can mean getting your fingers burned. So it was for the buyers of early solid state drives (SSDs) based on JMicron flash memory controllers. Their digits were scalded to the third degree. The problem was stuttery, laggy drive performance. But that was then. The now is a brand new controller from JMicron and a glimmer of hope that the brand might just be resurrected in the eyes of performance enthusiasts. Our first taste of the JMicron JMF616 comes in the form of the new ADATA S596 Turbo, a 128GB 2.5-inch SSD. It not only has that new controller going for it, but also the relative novelty of a built-in USB port. 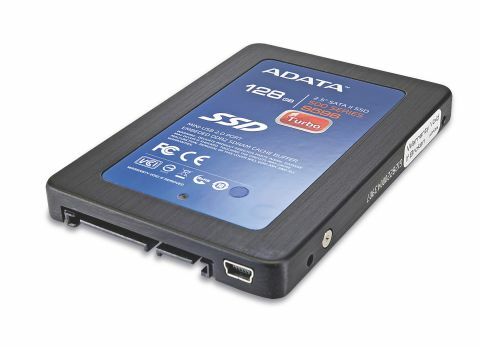 In other words, you can use this SSD as an external USB drive without the need for an enclosure. Elsewhere, the ADATA S596 Turbo clocks in with pretty competitive specifications, including official read and write maximums of 260Mbps and 210Mbps respectively, and support for the all-important Windows 7 TRIM command.